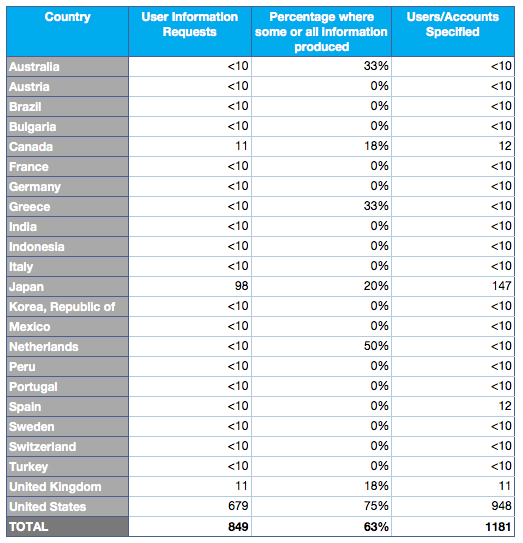 In honor of American independence, Twitter has released its first ever transparency report. 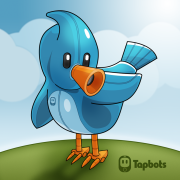 The Twitter Transparency Report includes data from January 1, 2012 through June 1, 2012, and Twitter says it plans to update the information twice a year. The transparency report is pretty much what it sounds like--Twitter's attempt to be transparent about which governments are requesting information from Twitter, what percentage of those requests produced some or all information, and how many accounts were specified in those requests. Such requests, as Twitter points out, are typically connected with criminal investigations. Not surprisingly, our very own United States is the nosiest government, with 679 requests in the past six months, targeting almost 1000 user accounts. The United States' requests accounted for 80 percent of all requests (out of 23 countries). The second nosiest government was Japan, with 98 requests in the past six months, targeting almost 150 user accounts. Twitter notes that it does not comply with every government request for a variety of reasons. For example, the report states, Twitter does not comply with government requests that do not identify a specific Twitter account, seeks to narrow overly-broad requests, and may not comply with a request if a Twitter user challenges the request after being notified. Twitter says it notifies users of requests for their account information, except when prohibited by law. Twitter's Transparency Report is at least partially motivated by Google's Transparency Report, which the company has been posting for about two years. In its blog post announcing the report, Twitter notes that the report is "inspired by the great work done by our peers @Google," and that the main goal of the report is to "shed more light on government requests received for user information, government requests received to withhold content, and DMCA takedown notices received from copyright holders." The Transparency Report also gives information on the number of "formal government requests" Twitter has received to remove or withhold content on Twitter. This chart shows the number of removal requests by court order and by government agencies, the percentage of instances in which some or all content was removed (0 percent in every case, during the past six months), and the number of accounts specified. Twitter apparently only received six removal requests in the past six months, which is good news--it means governments are not outright censoring social media (though they may, of course, be secretly censoring it). According to Twitter, the company receives a large number of "misfiled, non-copyright complaints" through its web form, and so does not comply with every request.